Teen love story meets murder mystery within an eye color obsessed, “idyllic” commune. After sixteen-year-old Jade discovers her late grandmother was poisoned, she’s devastated yet determined to find the killer commune member and their motive. With help from her mysterious friend Tyrian, and Peaches, the commune leader’s sweet daughter; Jade unearths dark secrets that involve her mother’s affair, her maternal grandparent’s abandonment, and a plethora of murders. To make matters worse, someone is hell bent on ending Jade’s mission for the truth. Jade can’t continue conforming to an evil society and yet she fears the Outside is just as corrupt. If she resolves to flee and is caught, the punishment is banishment to the slave cabins… and blinding. At age 11, Rosie O’Brien, daughter of an Irish Rebel, is sentenced to 14 years in prison and transported to the other side of the world – to the far Colony of New South Wales (Australia). The year is 1804 and in this wild place Rosie has only herself to rely on. Her letters home record the trials, hardships and miracles that befall her. Somewhere in this God forsaken land is her convict father. Even if he still lives, can she hope to find him? This young girl’s survival is based on real convict experiences. Suitable for readers aged 8 – 12 years. Price: $1.99 – Illustrated PDF download from Scribd. The year is 1955. If you grew up in the 1950s and the 1960s, you may be among those who recall those good old “Happy Days” of television fame. Even younger generations enjoy watching TV reruns to get a peek into what life was like back then. 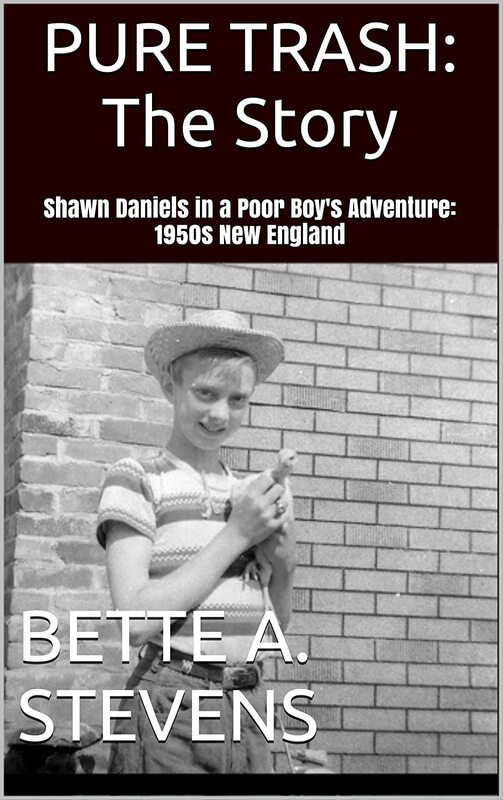 In this short story, Shawn and Willie Daniels are off on a Saturday adventure in search of trash to turn into treasure. It is going to be a great day. Shawn is sure of it. No school and no bullies to remind him that he’s not one of the crowd. PURE TRASH: The Story is about bullies, both in the traditional and non-traditional sense. It may redefine your definition of bullying. Torment, persecution, intimidation… These are a few descriptors of what those who are considered “different” in some way may suffer. For Shawn and Willie, their “difference” is based upon the social status of the dysfunctional family, the alcoholism and the abject poverty in which they grew up. This entry was posted in Author, Book Promotion Day, Novel, Short story and tagged Amazon, Author, Book, books, E-book, ebooks, Fiction, novel, Short story by Steve. Bookmark the permalink. A big thanks for including my book – Letters of a Convict Girl – in your book promo day. And for your email with ‘words of wisdom’ on blogging. I’d better stop hovering on the brink, I guess, and take the plunge.